Apple fans would agree that when (if) Apple release their iTV or a television from Apple, it would be a television that would revolutionize the HDTV industry, the iTV “would just work”, and it would be “magic.” Well, we can agree to those things with this iTV concepts made by Guilherme M. Schasiepen on Flickr. 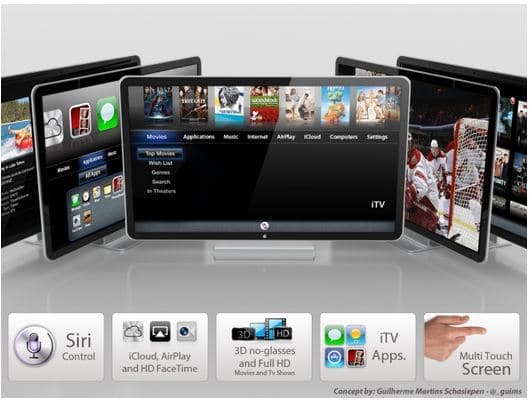 The iTV on this concepts images features iOS similar features such as iCloud, AirPlay, and HD FaceTime. The Concept also says to have 3D without using 3D glasses and full HD 1080p. It also has a Muti Touch display, and apps for the TV. It’s fancy.